Chuparosa Vineyards has many opportunities to support and help raise funds for deserving local organizations. This year we have made the following selections. Please come out to see us at these events, and join us in Supporting San Diego! 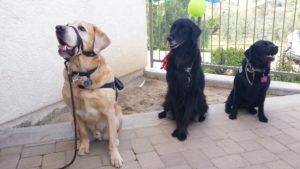 Chuparosa Vineyards has joined with our neighbors Hidden Gem Vineyards to honor the memory of our canine friend (and Director of Guest Operations), Carson, by raising funds for Next Steps Service Dogs. 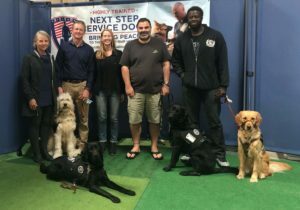 NSSD provides service dogs for active military, veterans, and first responders with PTSD. During this last year, Chuparosa Vineyards’ customers, together with Hidden Gem Vineyards’ friends and family raised a “poop load” of cash, which we had the pleasure of delivering to NSSD at their facility in Escondido CA. Thank you for your generosity, and to Carson for the inspiration. Chuparosa Vineyards supports Edible San Diego, a high quality magazine which brings the reader a timely and intimate view of local food and drink in San Diego, connecting consumers with local growers, retailers, chefs, and food artisans. Saturday, 22 June 2019 @ 5PM – Poway Center for the Performing Arts Taste of Our Towne VIII – All proceeds benefit the Poway Center for the Performing Arts Foundation’s Arts in Education Initiative and Professional Performance Series. Chuparosa Vineyards will be supporting this event for the 7th year in a row. Many outstanding local restaurants will join area wineries with samples of their best offerings. Poway Center for the Performing Arts: 15498 Espola Road, Poway CA. Sunday, 9 September 2018 @1:30PM – 8th Annual Terry Spencer Memorial Golf Celebration – The Vineyard Golf Course 925 San Pasqual Rd., Escondido CA. We will be pouring wine on the grass outside the clubhouse to help raise funds for the American Lung Association. Contact collenspencer19@gmail.com 858.538.4148. Saturday, 4 August 2018 @ 6PM – Carlsbad Rotary Wine and Vine Jubilee – Uncorked fundraiser. Chuparosa Vineyards will be pouring our 2012 Estate Sangiovese at this beautiful and delicious event that honors the contributions of Pete Anderson to the development of the San Diego County wine industry. Contact Julie Norby 858-465-0067. In 2018 Chuparosa Vineyards was honored to be recognized at this event for our contributions in launching a renaissance of the wine industry following the enactment of San Diego County’s four-tiered winery ordinance in 2010.